Begin with the sole itself, ask your fishmonger to skin and trim your sole ready for roasting but keep the trimmings to make the sauce. Melt the butter in a pot over a low heat until the milk solids have fallen to the bottom. Using a brush paint the fish on both sides with plenty of butter but only from the top of the pot, season with a little salt and pepper before placing on a roasting tray and into a preheated oven at 180 degrees. This should take no more than 12 minutes to cook through. Once cooked squeeze a little lemon juice over and allow to rest a little before serving. 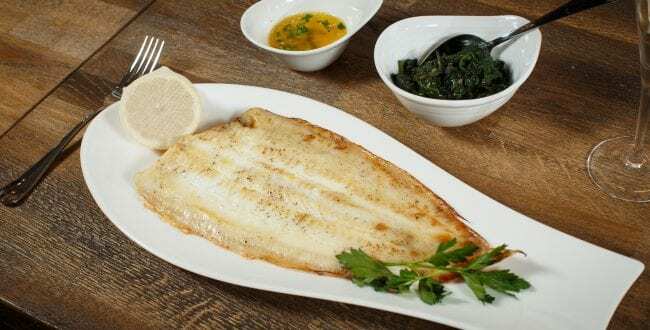 To Serve: Place the Sole in the centre of the plate and spoon plenty of the butter down the centre of the fish, garnish with a little lemon and pea shoots or a sprig of parsley. Served with a little wilted spinach alongside, BEAUTIFUL!